AutoProof Pro™ Braille is an advanced 3D braille analysis tool. Using a specially designed enclosure unit a detailed 3-dimensional model of embossed braille dots are produced. This allows for analysis of not only spacing and geometry, but for quality of embossed, shapes and readability. Decoded braille values can be compared to other documents, alphanumeric values or PDF files with a braille layers. Designed for speed and simplicity, AutoProof Pro™ Braille can quickly inspect an entire carton or conduct multiple batch processes within seconds! A pass/fail indicator is displayed to the operator, as well as a sophisticated 3D analysis of the results. AutoProof Pro™ Braille is a part of a modular system integrated within the AutoProof Pro™ Imaging Suite collection. This collection is 21 CFR Part 11 compliant and features a repository for storing all braille projects allowing for easy recall and processing. For more information, product features and technical specifications view the data sheet below. 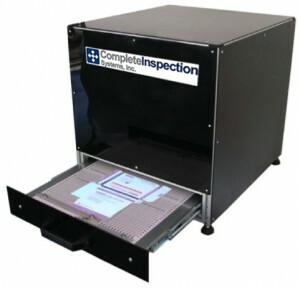 © 2019 Complete Inspection Systems, Inc.